Hello! I’m Keira and I just relocated from London to San Francisco with my husband Jim. We got married July 2011 in my hometown, Santa Cruz, California and then moved across the pond to London for just under two years. We had an incredible time touring Europe, working in London, making new friends and loving our first year as a married couple. Now that we're back, we've traded in the Tube and our wellies for the bus and a dose of much needed sunshine. It's been a big change, but it really doesn't get better than the California coast (or San Francisco, but I'm biased). I created tiny bit of joy to share my life with all of you. 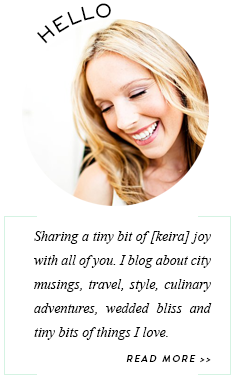 I write about city musings, design inspiration, travel, culinary adventures, occasional wedding style, and tiny bits of things I love. Feel free to drop me a note at tinybitofjoy@gmail.com or leave a comment on my posts. I’m so glad you've stopped by...visit again soon!